Rainbows are phenomena of light, its perception by the physical senses and the conceptual mind which produces the appearance of a spectral band of colors, often apparently high in the sky, but also at times in close proximity to the observer. The spectrum of colors produced is also itself referred to as the rainbow, and is associated with similar optical phenomena, such as halos, glories, and iridescence. It is widely used symbolically in ways denoting harmonious unity of purpose amidst diversity by various ethnic, religious and other social groups, and as a sign of a divine covenant, being, or a mystical or magical bridge between mortal and immortal realms in various cultures. God put the rainbow in the clouds, not just in the sky… It is wise to realize we already have rainbows in our clouds, or we wouldn't be here. If the rainbow is in the clouds, then in the worst of time, there is the possibility of seeing hope … We can say "I can be a rainbow in the cloud for someone yet to be." That may be our calling. You may not control all the events that happen to you, but you can decide not to be reduced by them. Try to be a rainbow in someone's cloud. And a straight-shooting son of a gun. In ancient classical literature the rainbow sometimes was deified as Iris; at other times it was regarded merely as the route traversed by the messenger of Hera. The rainbow brightens to the setting Sun. A Hebrew belief asserted that if Yahweh lays aside his bow and hangs it in the clouds, this is a sign that his anger has subsided. Other peoples have had similar ideas, based upon the tradition that an archer carries his bow with the ends pointing downward when he wishes to indicate his peaceful intentions. In ancient classical literature the rainbow sometimes was deified as Iris; at other times it was regarded merely as the route traversed by the messenger of Hera. 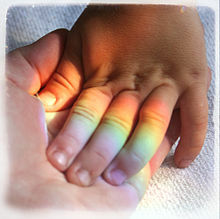 The conception of the rainbow as a pathway or bridge has been widespread. For some it has been the best of all bridges, built out of three colors; for others the phrase "building on the rainbow" has meant a bootless enterprise. North American Indians were among those who thought of the rainbow as the Pathway of Souls, an interpretation found in many other places. Among the Japanese the rainbow is identified as the "Floating Bridge of Heaven"; and Hawaiian and Polynesian myths allude to the bow as the path to the upper world. In the Austrian Alps the souls of the righteous are said to ascend the bow to heaven; and in New Zealand the dead chieftains are believed to pass along it to reach their new home. In parts of France the rainbow is called the pont du St. Esprit, and in many places it is the bridge of St. Bernard or of St. Martin or of St. Peter. Basque pilgrims knew it as the 'puente de Roma'. Sometimes it is called instead the Croy de St. Denis (or of St. Leonard or of St. Bernard or of St. Martin). In Italy the name arcu de Santa Marina is relatively familiar. Associations of the rainbow and the milky way are frequent. The Arabic name for the milky way is equivalent to Gate of Heaven, and in Russia the analogous role was played by the rainbow. Elsewhere also the bow has been called the Gate of Paradise; and by some the rainbow has been thought to be a ray of light which falls on the earth when Peter opens the heavenly gate. In parts of France the rainbow is known as the porte de St. Jacques, while the milky way is called chemin de St. Jacques. In Swabia and Bavaria saints pass by the rainbow from heaven to earth; while in Polynesia this is the route of the gods themselves. In Eddic literature the bow served as a link between the gods and man — the Bifrost bridge, guarded by Heimdel, over which the gods passed daily. At the time of the Gotterdamerung the sons of Muspell will cross the bridge and then demolish it. Sometimes also in the Eddas the rainbow is interpreted as a necklace worn by Freyja, the "necklace of the Brisings," alluded to in Beowulf; again it is the bow of Thor from which he shoots arrows at evil spirits. Among the Finns it has been an arc which hurls arrows of fire, in Mozambique it is the arm of a conquering god. 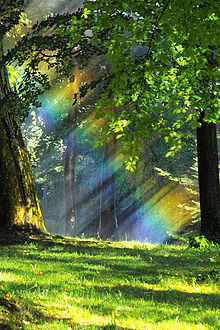 In the Japanese Ko-Ji-Ki (or Records of Ancient Matters), compiled presumably in 712, the creation of the island of Onogoro is related to the rainbow. Deities, standing upon the "floating bridge of heaven," thrust down a jeweled spear into the brine and stirred with it. When the spear was withdrawn, the brine that dripped down from the end was piled up in the form of the island. In myth and legend the rainbow has been regarded variously as a harbinger of misfortune and as a sign of good luck. Some have held it to be a bad sign if the feet of the bow rest on water, whereas a rainbow arching from dry land to dry land is a good augury. Dreambooks held that when one dreams of seeing a rainbow, he will give or receive a gift according as the bow is seen in the west or the east. The Crown-prince Frederick August took it as a good omen when, upon his receiving the kingdom form Napoleon in 1806, a rainbow appeared; but others interpreted it as boding ill, a view confirmed by the war and destruction of Saxony which ensued. By many, a rainbow appearing at the birth of a child is taken to be a favorable sign; but in Slavonic accounts a glance from the fay who sits at the foot of the rainbow, combing herself, brings death. The rainbow, based on ocean, span the sky. To teach me what thou art. Caustics are the brightest places in an optical field. They are the singularities of geometrical optics. The most familiar caustic is the rainbow, a grossly distorted image of the Sun in the form of a giant arc in the skyspace of directions, formed by the angular focusing of sunlight that has been twice refracted and once reflected in raindrops. That only eyes of spirits might behold. And the bow shall be in the cloud; and I will look upon it, that I may remember the everlasting covenant between God and every living creature of all flesh that is upon the earth. And God said unto Noah, This is the token of the covenant, which I have established between me and all flesh that is upon the earth. We may run, walk, stumble, drive, or fly, but let us never lose sight of the reason for the journey, or miss a chance to see a rainbow on the way. O beautiful rainbow;—all woven of light! And sing,—"The rainbow! the rainbow! The smile of God is here." Follow the fellow who follows the dream. No less than laboring seas. Be our eyes in coming years. On the cloud mist of our tears. The idea of immortality, that like a sea has ebbed and flowed in the human heart, with its countless waves of hope and fear, beating against the shores and rocks of time and fate, was not born of any book, nor of any creed, nor of any religion. It was born of human affection, and it will continue to ebb and flow beneath the mists and clouds of doubt and darkness as long as love kisses the lips of death. It is the rainbow — Hope shining upon the tears of grief. Nor trusts the gorgeous sky. We could not keep in mind that it was celestial fire we were looking at, — fire cool as the water-drops out of which it was born, and on which it reclined. It lay apparently upon the trees, diffused itself among them, from the valley to the crown of the ridge, as gently as the glory in the bush upon Horeb, when "the angel of the Lord appeared unto Moses in a flame of fire, out of the midst of a bush; and he looked, and behold the bush burned with fire, and the bush was not consumed." It seemed like nothing less than a message to mortals from the internal sphere, — the robe of an angel, awful and gentle, come to bear a great truth to the dwellers in the valley. And it was, no doubt. It meant all that the discerning eye and reverent mind felt it to mean. That Arabian bush would have been vital with no such presence, perhaps, to the gaze of a different soul. Consider now the token of the covenant which God gave to Noah. It was the rainbow. What is the rainbow? Sunlight turned back to our eye, through drops of falling rain. What sign could be more simple? And yet what sign could be more perfect? Noah's sons would fear that another flood was coming, perhaps flood after flood. The token of the rainbow said to them. No. Floods and rain are not to be the custom of this earth. Sunshine is to be the custom of it. Do not fear the clouds and storm and rain; look at the bow in the cloud, in the very rain itself. That is a sign that the sun, though you cannot see it, is shining still. That up above, beyond the cloud, is still sunlight, and warmth, and cloudless blue sky. Believe in God's covenant. Believe that the sun will conquer the clouds, warmth will conquer cold, calm will conquer storm, fair will conquer foul, light will conquer darkness, joy will conquer sorrow, life conquer death, love conquer destruction and the devouring floods; because God is light, God is love, God is life, God is peace and joy eternal and without change, and labours to give life, and joy, and peace, to man and beast and all created things. This was the meaning of the rainbow. Not a sudden or strange token, a miracle, as men call it, like as some voice out of the sky, or fiery comet, might have been; but a regular, orderly, and natural sign, to witness that God is a God of order. Whenever there was a rainy day there might be a rainbow. It came by the same laws by which everything else comes in the world. It was a witness that God who made the world is the friend and preserver of man; that His promises are like the everlasting sunshine which is above the clouds, without spot or fading, without variableness or shadow of turning. She was sick with nausea so deep that she perished as she sat. And then, in the blowing clouds, she saw a band of faint iridescence colouring in faint colours a portion of the hill. And forgetting, startled, she looked for the hovering colour and saw a rainbow forming itself. In one place it gleamed fiercely, and, her heart anguished with hope, she sought the shadow of iris where the bow should be. Steadily the colour gathered, mysteriously, from nowhere, it took presence upon itself, there was a faint, vast rainbow. The arc bended and strengthened itself till it arched indomitable, making great architecture of light and colour and the space of heaven, its pedestals luminous in the corruption of new houses on the lowhill, its arch the top of heaven. And the rainbow stood on the earth. She knew that the sordid people who crept hard-scaled and separate on the face of the world's corruption were living still, that the rainbow was arched in their blood and would quiver to life in their spirit, that they would cast off their horny covering of disintegration, that new, clean, naked bodies would issue to a new germination, to a new growth, rising to the light and the wind and the clean rain of heaven. She saw in the rainbow the earth's new architecture, the old, brittle corruption of houses and factories swept away, the world built up in a living fabric of Truth, fitting to the over-arching heaven. If you mean that the proximity of one color should give beauty to another that terminates near it, observe the rays of the sun in the composition of the rainbow, the colors of which are generated by the falling rain, when each drop in its descent takes every color of the bow. The way I see it, if you want the rainbow you gotta be willing to put up with the rain. Amit RayWorld Peace: The Voice of a Mountain Bird (2014). The sky itself is the eighth color of the rainbow, spread over the whole sky for us, all the time. To dip his brush in dyes of heaven? Each in the other melting. The true harvest of my daily life is somewhat as intangible and indescribable as the tints of morning or evening. It is a little star-dust caught, a segment of the rainbow which I have clutched. Rain, rain, and sun! a rainbow in the sky! The rainbow bursts like magic on mine eyes! Frail in its date, eternal in its guise. We of many cultures, languages and races are become one nation. We are the Rainbow People of God. Of thy Lord's hand, the object of His eye! And minds the covenant between all and One. An argument can be legitimately sustained only if the participants are speaking about the same level. Argumentation would — for the most part — be replaced with something akin to Niels Bohr's principle of complementarity. Information from and about the different vibratory levels of bands of consciousness — although superficially as different as X-Rays and radio waves — would be integrated and synthesized into one spectrum, one rainbow. … Each band or level, being a particular manifestation of the spectrum, is what it is only by virtue of the other bands. The color blue is no less beautiful because it exists along side the other colors of a rainbow, and "blueness" itself depends upon the existence of the other colors, for if there were no color but blue, we would never be able to see it. In this type of synthesis, no approach, be it Eastern or Western, has anything to lose — rather, they all gain a universal context. And the universe thrills at the sight. Ella Wheeler Wilcox, in The Rainbow of Promise"
A ribbon in the sky for our love. A rainbow in the sky!